Orbi Dubai ... no limits to human imagination. Over its 5,200-sq-m expanse at the City Centre Mirdif, Orbi Dubai allows nature lovers to explore and experience the beauty of planet Earth using amazing digital experience and interactive technology. With the recently-opened Orbi Dubai at the City Centre Mirdif, Majid Al Futtaim has once again pushed the frontiers of human imagination and created a visitor attraction that captivates the senses of nature lovers, allowing them to explore and experience the beauty of planet Earth. 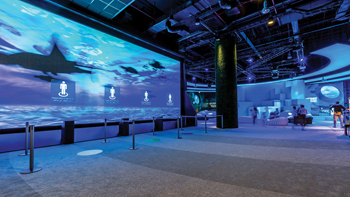 The first facility of its kind outside Japan which opened its doors last May, Orbi has been conceptualised to offer an amazing digital experience through interactive technology for people of all ages and walks of life. The interior design and MEP (mechanical, electrical and plumbing) engineering divisions of the Dubai-headquartered Bluehaus Group were responsible for the original concept for Orbi Dubai – and so impressive has its work been that the project has earned the group an SBID International Design Award for 2017 in the public space design category, which was announced at the end of October in London. Japanese technology and video game company Sega has been roped in provide the real-life experience, while the movie content is from BBC Earth’s world-renowned Natural History series. Through a series of different nature zones, Orbi creates unique experiences for visitors over its 5,200-sq-m expanse. Movie content is from BBC Earth’s world-renowned Natural History series. The design and layout of the facility has been created to enhance visitor experience, with some of the key zones being Animalpedia, Earth Palette, Base Camp, Theatre space and Time Slice. Once through the black entrance tunnel, visitors face a giant interactive screen 15-m long and 5-m high, featuring life-size visuals of animal shapes. Six stations are positioned in front of this screen with directional sound targeting each as the scanner tracks the movement of the guest at each station. 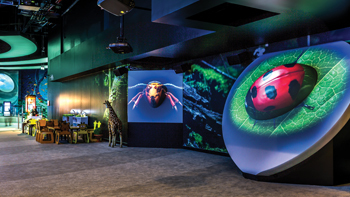 This experience called ‘Animalpedia’ allows visitors to virtually reach out to an animal on screen and it responds with pop-up facts. The next exhibition space is a circular room, the ‘Earth Palette’, which is a 360-degree visual treat with a wealth of images of animals, landscapes and plants in a spectrum of colours. Here, guests can place a coloured item on a table in the centre of the room; a camera then reads the colour, and nature scenes featuring that colour cover a wall with 2.5-m-high imagery. Visitors can “migrate” with elephants and experience how these huge mammals survive in the harsh nature of the African continent. They can feel the vibration of their stamping feet as they are taken on a virtual African journey into the wilderness. The space comprises a concave wide screen on each side and a smaller trapezoidal screen on each end to create a near 360-degree environment. 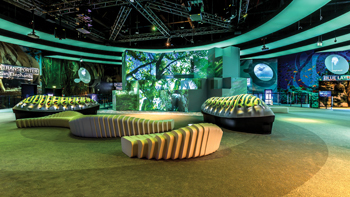 The centrepiece of Orbi Dubai is a giant screen up to 35 m in width – which plays custom-made BBC Earth films – amplified by two massive screens behind viewers to create a 360-degree, fully immersive experience. The 3D sound and visual technology gives visitors a realistic experience of various natural features, from high mountains, forests and the sea to the freezing polar environments. Technology from Sega provides real-life experience. Other exhibition zones include Base Camp, which features projection mapping to exhibit beautiful images captured by BBC Earth onto walls, and a standalone sculpture. The sculpture changes character to represent different animals, which interact when touched. The highly-interactive Time Slice allows visitors to gauge their performance in relation to some of the swiftest animals on Earth. They can even pose alongside their favourite animals at the Extreme Photo Spot green screen experience. Other highlights of the experiences are the Mountain Gorilla section, where 3D film is merged with a special effect 4D experience, transporting visitors to a BBC Earth location shoot with mountain gorillas; Blue Layer, which provides a breath-taking underwater journey beneath the sea; and Earth Cruising, which takes visitors soaring over the natural world to enable them to see beauty of the planet unfold before their eyes. A number of challenges were encountered in creating this unique attraction. Being located in the City Centre Mirdif and adjacent to the iFly centre, one of the key issues that needed to be addressed was the acoustics, the spokesman says. “The acoustic design criteria proposed for this project was assessed using a holistic approach to provide an excellent standard of acoustic comfort, privacy and speech intelligibility to comply with the highest international design standards,” he adds. Other issues included the air distribution and the location of the fire alarm, so as not to compromise the fully-immersive experience. The spokesman explains that the air distribution had to be configured such that it does not interfere with the effects (fog) and the fire alarm such that neither life safety nor the audience experience is compromised. “In the two main theatres – ‘Meet the Komodo’ and ‘Earth Theatre’ – we designed displacement ventilation to avoid air movement from interfering with the fog effects,” he adds. A sophisticated 22-point sound system with 3D soundscapes creates the effect of polar bears stalking up behind the audience, birds soaring overhead or ocean waves crashing all around. Orbi uses scent technology, wind, fog, strobe lighting and vibrations to create the ultimate nature film experience. In the ‘World Transporter’ zone, the African elephant exhibit uses an innovative pneumatic (air) system to drive the floor effects, replacing the polluting oils and fluids used in such systems in the past, according to the spokesman. And the ‘Time Slice’ exhibition uses a high-speed camera to capture the movements of visitors in slow motion so they can compare themselves with various animals. The lighting is designed with RGB to change colour and is digitally controlled to interface with the different settings and sculpture changes in each attractions. In addition, all MEP and engineering was hidden and designed in a way so as not to interfere with projections. In addition, furniture pieces have been specially designed for Orbi, including the organic-shaped benches placed in the main area and in one of the theatres. The spokesman says all materials were carefully selected to ensure they conform to Leed (Leadership in Energy and Environmental Design) standards. Also, the Sega technology used in Orbi Dubai uses less power and cooling across specific exhibits within the facility, which in turn reduces energy consumption across the board.